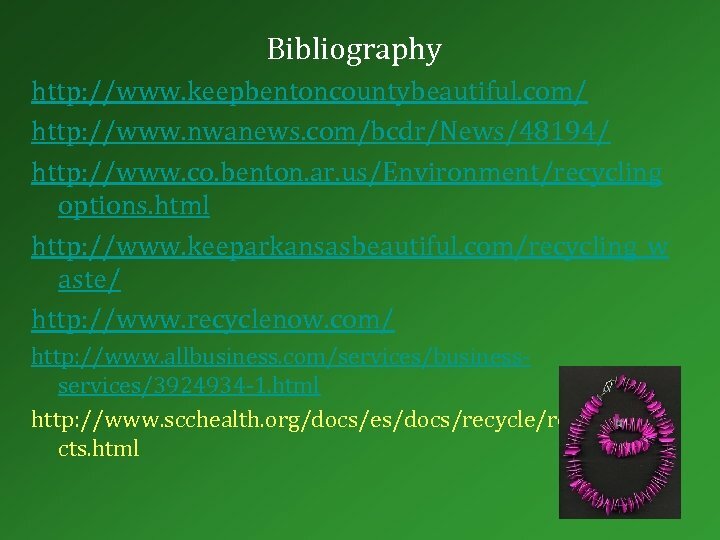 Recycling Facts • In 1999, recycling and composting activities prevented about 64 million tons of material from ending up in landfills and incinerators. 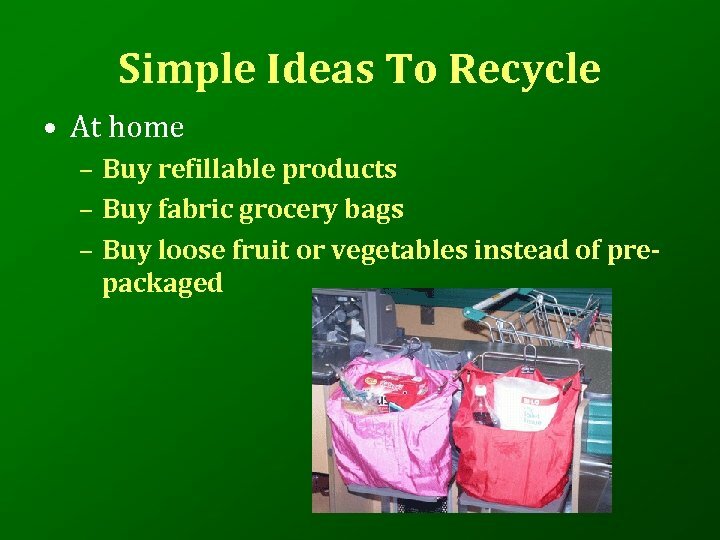 • 42% of all paper, 40% of all plastic soft drink bottles, 55% of all aluminum beer and soft drink cans, 57% of all steel packaging, and 52% of all major appliances are now recycled. 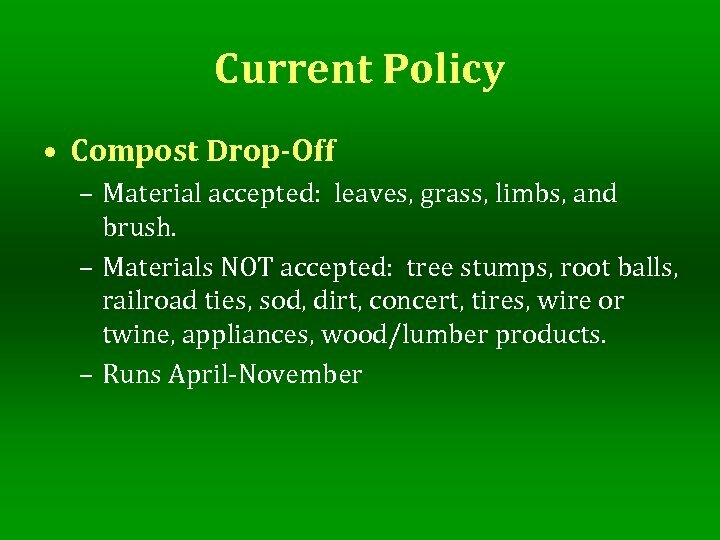 However, it is in the hands of each individual to make sure these items are disposed of properly. 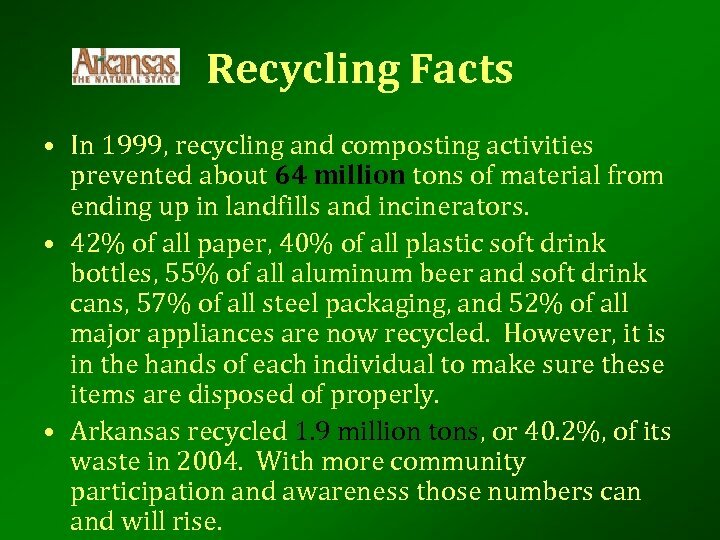 • Arkansas recycled 1. 9 million tons, or 40. 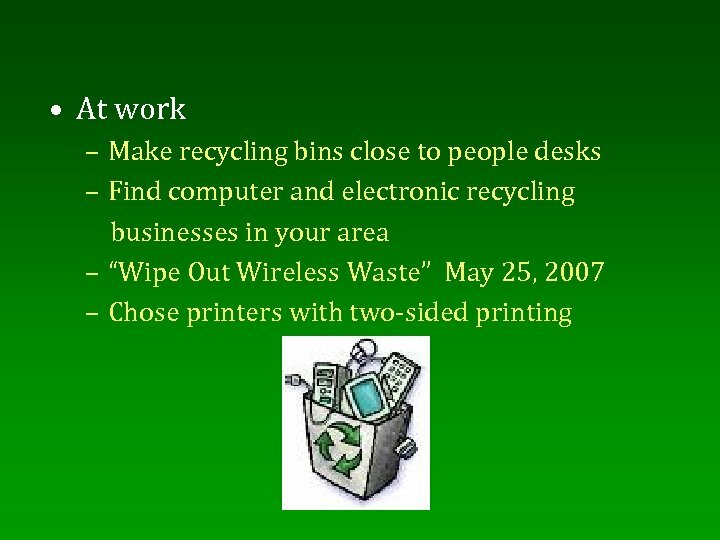 2%, of its waste in 2004. With more community participation and awareness those numbers can and will rise. 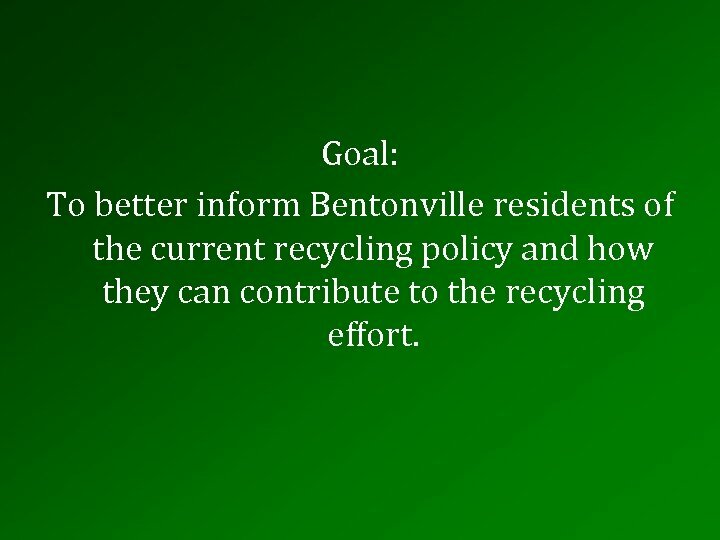 Goal: To better inform Bentonville residents of the current recycling policy and how they can contribute to the recycling effort. 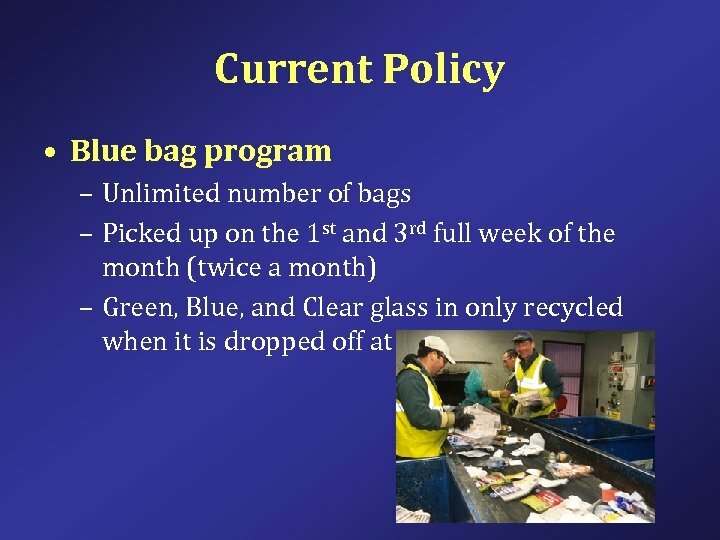 Current Policy • Blue bag program – Unlimited number of bags – Picked up on the 1 st and 3 rd full week of the month (twice a month) – Green, Blue, and Clear glass in only recycled when it is dropped off at the facility. 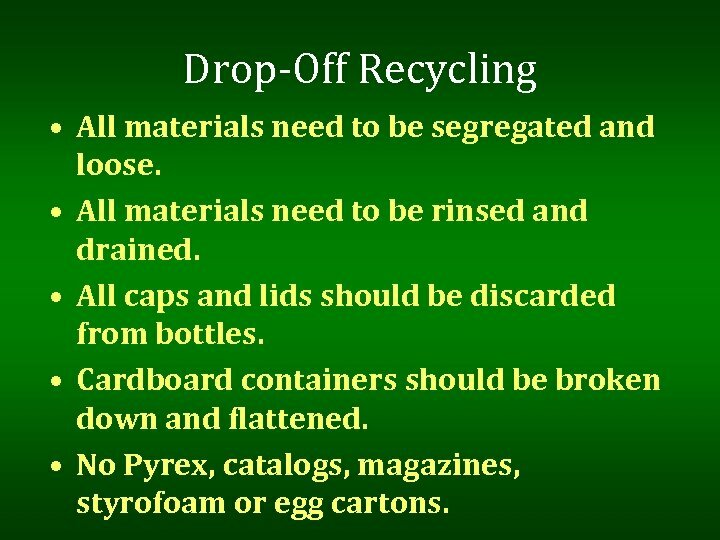 Drop-Off Recycling • All materials need to be segregated and loose. 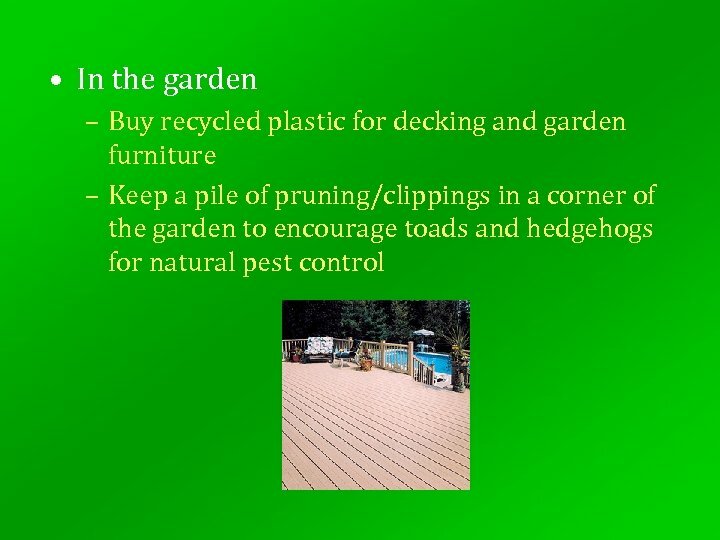 • All materials need to be rinsed and drained. • All caps and lids should be discarded from bottles. 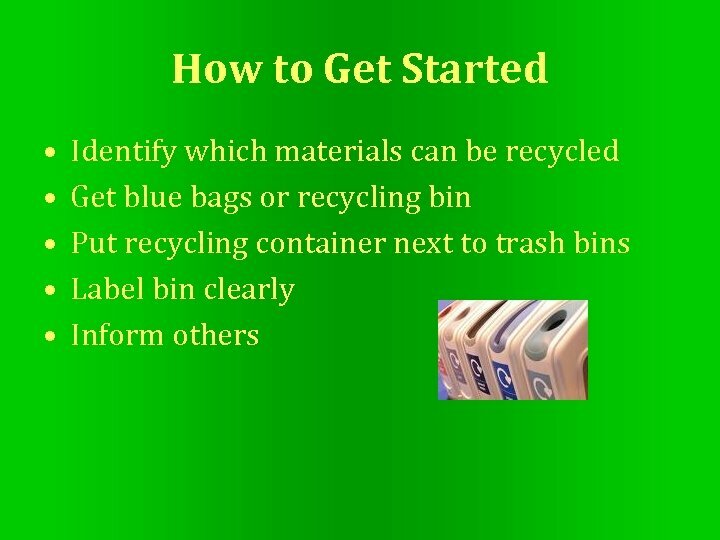 • Cardboard containers should be broken down and flattened. 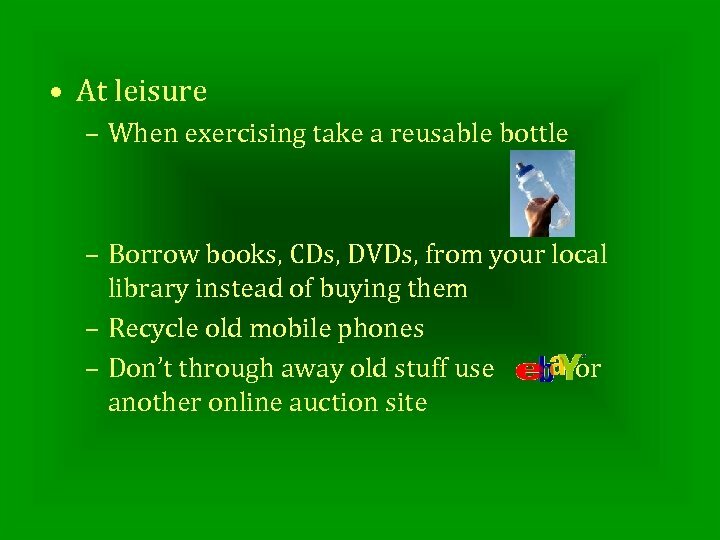 • No Pyrex, catalogs, magazines, styrofoam or egg cartons. 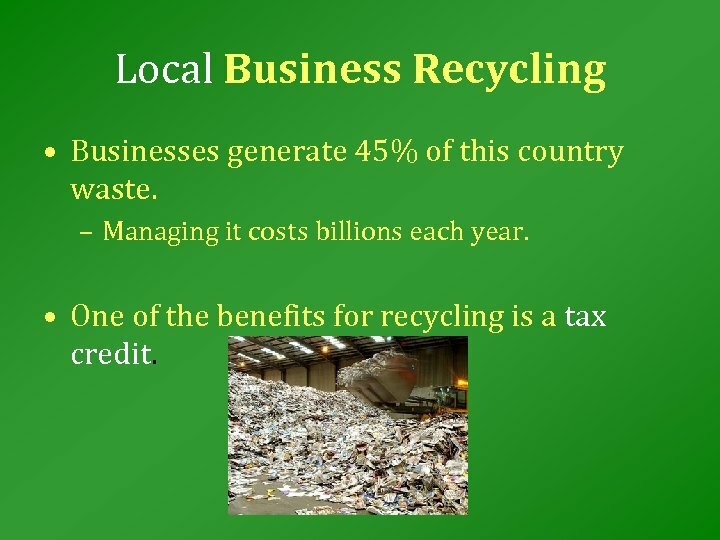 Local Business Recycling • Businesses generate 45% of this country waste. – Managing it costs billions each year. 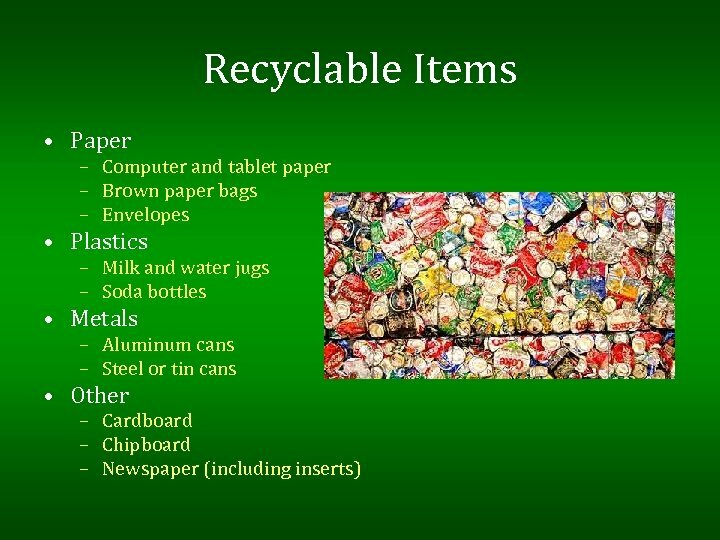 • One of the benefits for recycling is a tax credit. 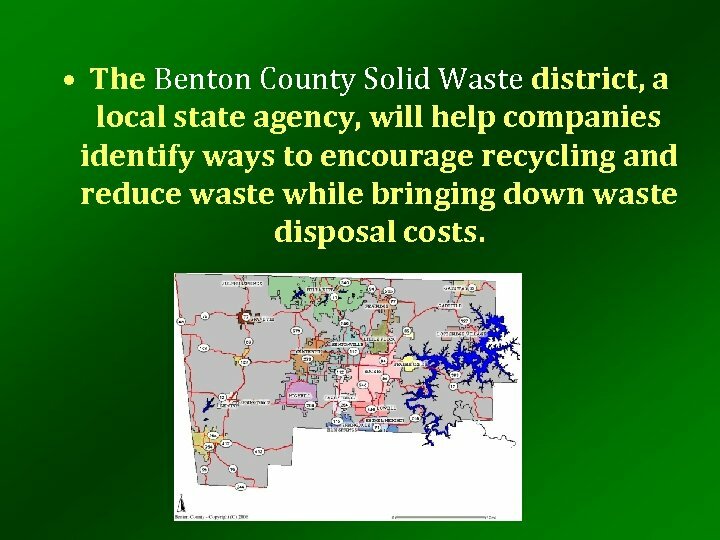 • The Benton County Solid Waste district, a local state agency, will help companies identify ways to encourage recycling and reduce waste while bringing down waste disposal costs. 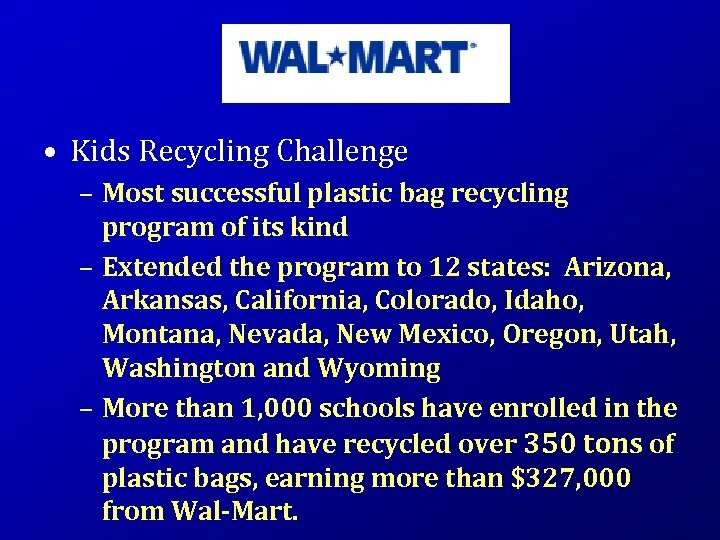 • Kids Recycling Challenge – Most successful plastic bag recycling program of its kind – Extended the program to 12 states: Arizona, Arkansas, California, Colorado, Idaho, Montana, Nevada, New Mexico, Oregon, Utah, Washington and Wyoming – More than 1, 000 schools have enrolled in the program and have recycled over 350 tons of plastic bags, earning more than $327, 000 from Wal-Mart. 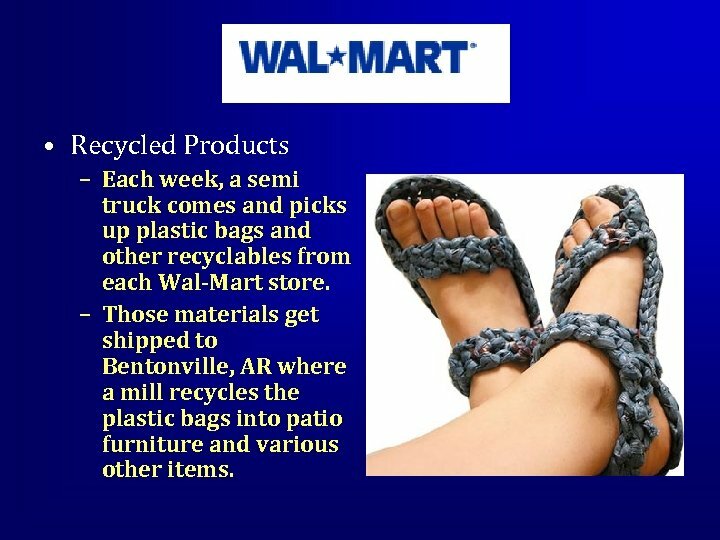 • Recycled Products – Each week, a semi truck comes and picks up plastic bags and other recyclables from each Wal-Mart store. 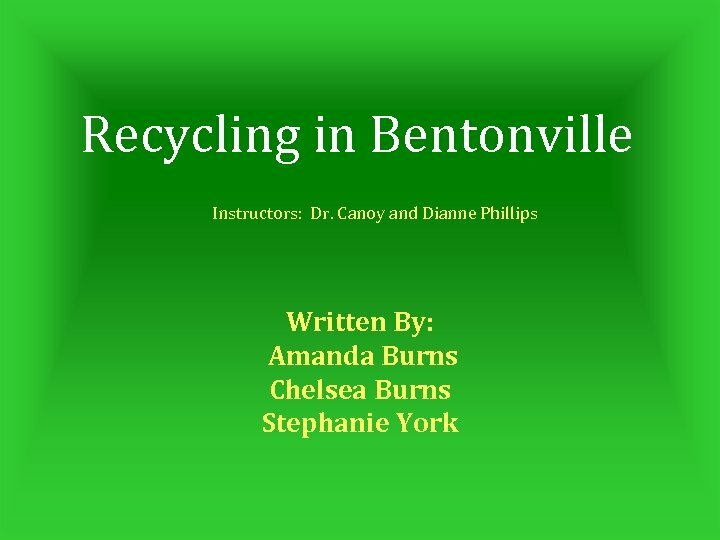 – Those materials get shipped to Bentonville, AR where a mill recycles the plastic bags into patio furniture and various other items. 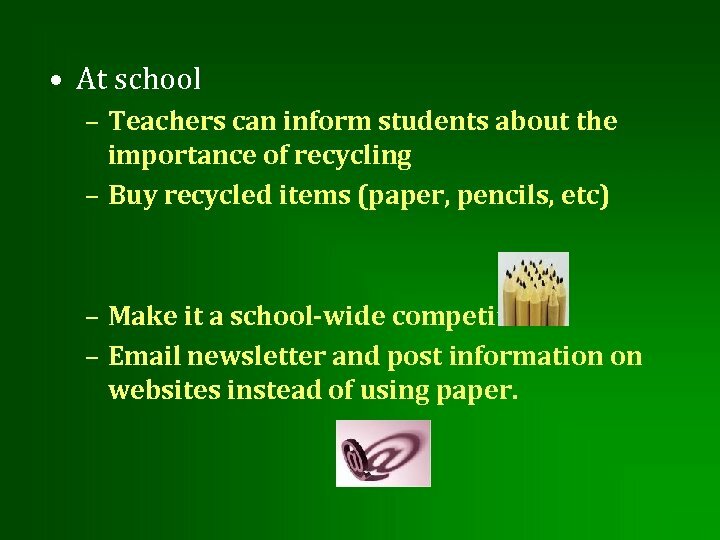 • At school – Teachers can inform students about the importance of recycling – Buy recycled items (paper, pencils, etc) – Make it a school-wide competition – Email newsletter and post information on websites instead of using paper.